Old RFDS logo at Alice Springs Base. The Royal Flying Doctor Service of Australia (RFDS) is a medical service in Australia. It was the first flying medical service in the world. It provides emergency and other health care to people living in rural and remote areas. It is a not-for-profit organisation. Communities in the Outback and the bush are generally small, and spread over large distances. Many farms, stations and outstations are located far from towns over rough trails. Because of this, many of these places do not have access to hospitals or doctors. The Flying Doctor Service brings medical service to them. It can land planes in any community that has an airstrip. Today it has a fleet of about 60 planes. They fly from 21 bases located across Australia. One of the original de Havilland DH.50 planes flown by Qantas. 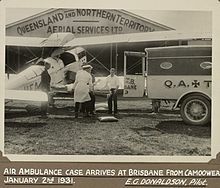 Here it is delivering a patient to hospital in Brisbane in 1931. The service was started by Reverend John Flynn. He had worked in rural areas of Victoria. In 1912, he was asked by the Presbyterian Church to look at the needs of people living in the Northern Territory. His report about it led to the creation of the Australian Inland Mission (AIM). Flynn became the manager of this. It began as one nursing clinic. By 1926, it had become a network of ten nursing clinics. On 15 May 1928, Flynn formed the AIM Aerial Medical Service. This was an experiment based in Cloncurry, in Queensland. AIM leased a de Havilland DH.50 plane from the Queensland and Northern Territory Aerial Service (Qantas). The plane was named Victory. It would fly doctors to remote communities. The service answered its first call on 17 May 1928. From Cloncurry, the plane flew 137 kilometres (85 mi) to Julia Creek in central Queensland. Within its first year of operations, the service flew more than 30,000 kilometres in 50 flights. It became the world's first flying ambulance service. From the mid-1920s, Flynn had been experimenting with radio together with Alfred Traeger. Traeger built the first pedal-powered transmitter in 1929. It allowed people in remote places to contact a central medical base. These transmitters were given out gradually to stations, missions and other communities around Cloncurry. Cloncurry was the base site for a large transmitter. During its first few decades, the service got most of its money from community fundraising, volunteers and donations. Today, the service gets financial help from the federal and state governments. But it still needs money from fundraising and donations from the community. Until the 1960s, the service mostly leased planes and pilots. After this point, the service moved on to buying its own equipment and employing its own pilots and mechanics. By the early 1930s, there was growing interest in expanding the service across the continent. Demand for its services was increasing. In response, the service expanded its fleet by hiring more planes and more pilots. Money from fundraising and the Australian Government helped to finance the project. In 1934, it became the Australian Aerial Medical Service. It opened up new bases across the country, in Wyndham, Port Hedland, Kalgoorlie, Broken Hill, Alice Springs, Meekatharra, Charters Towers and Charleville. These bases were organised into "sections". A council to manage the organisation was formed in 1936. The service's name was changed to the Flying Doctor Service in 1942. It was given the honorific "Royal" in 1955. ↑ 1.0 1.1 "Australians: John Flynn". Behind the News. Australian Broadcasting Corporation. Archived from the original on 10 February 2004. Retrieved 5 February 2014. ↑ 2.0 2.1 2.2 "Reverend John Flynn (1880–1951)". Reserve Bank of Australia. Archived from the original on 2 February 2009. Retrieved 5 February 2014. ↑ "RFDS Annual Report 2011/12" (PDF). Sydney: Royal Flying Doctor Service. 30 June 2012. p. 7. Retrieved 9 January 2013. ↑ 4.0 4.1 4.2 Ryan Corbett Bell (2009). The Ambulance: A History. McFarland. pp. 163–166. ISBN 9780786438112. Richard Woldendorp and Roger McDonald (2002) Australia's Flying Doctors: The Royal Flying Doctor Service of Australia. Fremantle Arts Centre Press. ISBN 9781863683852. Bill Marsh (2012) The Complete Book of Australian Flying Doctor Stories. HarperCollins Australia. ISBN 9781743099261.